The Student Nonviolent Coordinating Committee (SNCC, often pronounced "snick": ) was one of the most important organizations of the Arkansas, and Maryland. SNCC played a major role in the sit-ins and freedom rides, a leading role in the 1963 March on Washington, Mississippi Freedom Summer, and the Mississippi Freedom Democratic Party over the next few years. SNCC's major contribution was in its field work, organizing voter registration drives all over the South, especially in Georgia, Alabama, and Mississippi. In the later 1960s, led by fiery leaders such as James Forman said he did not know “how much longer we can stay nonviolent” and in 1969, SNCC officially changed its name to the Student National Coordinating Committee to reflect the broadening of its strategies. It passed out of existence in the 1970s. Founded in 1960 and inspired by the libraries, public parks, public swimming pools, and movie theaters. At that time, all those facilities financed by taxes were closed to Blacks. The White response was often to close the facility, rather than integrate it. The Student Nonviolent Coordinating Committee (SNCC), as an organization, began with an Students for a Democratic Society (SDS). Out of this conference the SNCC was formed. Among important SNCC leaders attending the conference were John Lewis, Bernard Lafayette, James Bevel, and Marion Barry from the Nashville Student Movement. SNCC's first chairman was John Lewis. Stokely Carmichael and H. "Rap" Brown were chairmen in the late 1960s. SNCC's executive secretary, James Forman, played a major role in running the organization. In the years that followed, SNCC members were referred to as “shock troops of the revolution." SNCC took on greater risks in 1961, after a mob of John Lewis, put themselves at great personal risk by traveling in racially-integrated groups into Mississippi as they continued the Ride. Other bus riders followed, traveling through the deep South to test Southern compliance with Federal Law. At least 436 people took part in these Freedom Rides during the spring and summer of 1961. McComb, Mississippi in 1961 became the seed for much of SNCC's activities from 1962 to 1966. With funding from the Albany, and the Alabama Black Belt around Selma. All of these projects endured police harassment and arrests; KKK violence including shootings, bombings, and assassinations; and economic terrorism against those blacks who dared to try to register. TranscriptMemorandum: on the SNCC Mississippi Summer Project. Oxford, Ohio: General Materials (c. June 1964). Retrieved May 2, 2005. An Oral History with Terri ShawTranscript: . SNCC member and Freedom Summer participant. The University of Southern Mississippi Libraries Special Collections. Retrieved May 2, 2005. ^ Wills, John (2011). European journal of American Culture. ^ Selma – Cracking the Wall of Fear ~ Civil Rights Movement Veterans. ^ Encyclopædia Britannica. [. 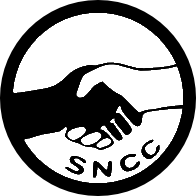 "Student Nonviolent Coordinating Committee (SNCC)"] . Encyclopædia Britannica Online. Encyclopædia Britannica Inc. Retrieved 6 May 2015. ^ "Guide to the Microfilm Edition of FBI Files on Black Extremist Organizations, Part 1". Lexis Nexis. The organization largely disappeared in the early 1970s, although chapters in some communities, such as New Jewel Movement in the otherthrow of Eric Gairy in 1979, the leader of the island of Grenada. He also became the chairman of the Free Nelson Mandela Movement in San Antonio, Texas. SNCC continued to maintain coalition with several white radical organizations, most notably UC Berkeley in October 1966, Carmichael challenged the white left to escalate their resistance to the military draft in a manner similar to the black movement. Some participants in ghetto rebellions of the era had already associated their actions with opposition to the Vietnam War, and SNCC had first disrupted an Atlanta draft board in August 1966. According to historians Joshua Bloom and Waldo Martin, SDS’s first Stop the Draft Week of October 1967 was “inspired by Black Power [and] emboldened by the ghetto rebellions.” SNCC appear to have originated the popular anti-draft slogan: "Hell no! We won't go!" For a time in 1967, SNCC seriously considered an alliance with Saul Alinsky's Industrial Areas Foundation, and generally supported IAF's work in Rochester and Buffalo's black communities. Those differences carried over into the voting rights struggle that centered on Bloody Sunday" on March 7, 1965. The goal of the Mississippi Summer Project was to organize the George Wallace received during the Democratic primaries in the North.